Gone are the days when a welly was just a welly, the days when eight pairs of socks were needed to make the horrible plastic things warm and comfortable! Now there are all sorts of technological advances and constructions that stand between hot, cold or wet feet and dry, perfect temperature tootsies! Our Boot Collections offer boots for those who appreciate fashion, practical boots for those who work hard, technical boots for those who need the crème de le crème in tough conditions, and there are even some that combine all three! Leather: A leather lining inside a boot offers a really high level of comfort, as well as a luxurious feel. The excellent insulation qualities, mixed with its ability to absorb perspiration and stop the feet from overheating makes leather lined boots a great ‘all-year-round’ option. Neoprene: Better known for being used to make wetsuits, neoprene is now being utilised far more widely; the incredible insulating properties mean it’s fast becoming a popular boot lining. As well as ensuring none of the wearer’s body heat is released from the boot, neoprene is also extremely comfortable. Many boots have different thickness options depending on how warm and snug you need them, 3mm of neoprene allows for comfortable wear in temperatures down to -15C and 5mm in temperatures down to -25C. This is the perfect choice of lining for very cold weather conditions or for those with poor circulation. GORE-TEX®: Boots with a GORE-TEX® membrane are guaranteed to be 100% completely waterproof. The great thing about achieving water tightness with GORE-TEX® is that it remains completely breathable; even though no water is able to enter through the fabric from outside, the membrane allows the passage of moisture vapour away from the inside of the boot. This will keep your feet dry (even from your own body moisture) and comfortable at all times. If waterproofness is on the top of the list for boot requirements this is the lining for you. Although all boots are made to be waterproof, GORE-TEX® has a higher effectiveness than almost all other materials. Jersey Cotton: Jersey cotton linings are designed to be comfortable for everyday wear. It stretches just like rubber to match its elastic properties. Using a combination of rubber and jersey the boot flexes to follow the foot exactly, mirroring even the smallest foot movements. Bamboo Carbon: A boot with a bamboo carbon lining is great for all seasons. The lining will keep your feet warm in winter and cool in summer by acclimatising to the variations in temperature. The lining is also able to wick moisture away if feet start to sweat. How do I know which boot is right for me? Think about what you’ll mainly be using them for. Your feet would be sweltering in a neoprene lined boot in the height of summer at your favourite festival; likewise, you would freeze in a cotton lined boot in the snow! If you practically live in your wellies it’s important to invest in a pair that will meet your requirements. Different brands use different lasts to build their boots so if you can, try a few on and see which best fit to your foot and leg shape – one man’s complete comfort is not necessarily anothers! If you wear your boots more than once a week, and especially if you rely on them for work, chances are you will need to upgrade from your average PVC fashion wellies (i.e. Hunter Originals and Joules), and progress to your more serious boots. Most standard boots have a very basic tread pattern and make up, they’ll be comfortable, but won’t have the standard you need for constant wear. A pair of Le Chameau’s for example, may seem like an expensive purchase, but believe me they will be worth it if you get the wear out of them and they’ll last you a long ole time. Do your research into soles. A sole can make or break a pair of boots; again, what kinds of sole you need depends on what you use them for, i.e. agricultural, working, shooting, horse riding, walking etc. Also consider how easy you find boots to get on and off, most boots have an adjustable side or side zip alternative to aid removal. Barbour: Barbour wellington boots have actually improved significantly over the last few years. The new Tempest Boots are the most robust and feature a neoprene lining for supreme warmth and comfort. The other Barbour Boot options are more of your every day, essential wear boots. They all have a non-slip sole and a handy kick-spur for easy removal. Hunter: Hunter has been manufacturing footwear since 1856. The original mill in Scotland produced over 1 million boots during World War One, proving the newly patented vulcanised process, to produce durable rubber products, was truly revolutionary. Since their humble beginnings, Hunter has gone from strength to strength. Firstly they were awarded two royal warrants for quality footwear and then the original Boot was worn by Lady Diana Spencer in her engagement photographs. Since, Hunter is consistently seen upon the feet of major celebrities and saturates the festival footwear market. Joules: Joules are a fun, quintessentially British brand celebrating their 25th year. In that time, their Joules Wellington Boots sure do keep us entertained! They are always adorned with the latest eye catching designs, as well as being made with absolute comfort in mind. They must be doing something right; they’ve sold over 1.4 million pairs! Le Chameau: The Master Boot Maker! Le Chameau are renowned for using traditional tools and high quality materials to produce their iconic boots. Every boot is hand made by a single ‘Maître Bottier’, who have boot making down to a real art form. They really put some thought into the different uses of your boots too; they have the widest range of purpose built soles. Seeland: A highly technical speciality shooting brand with quality at the forefront of their products, Seeland wellington boots combine top quality hardwearing rubber with strong profiled outer sole for excellent grip. As the brand suggests, most of their boots are angled to be more suitable for the hunter/shooter, but this doesn’t mean they are not fit for other purposes. Dubarry: Thanks to their combination of the best components, technology and craftsmanship, Dubarry of Ireland’s boots have a reputation that’s second to none. All of the leathers used in the range are uniquely water resistant, with quick dry properties to ensure that you boots retain their shape over time, whilst the use of GORE-TEX® in the linings offers your feet excellent waterproofing and breathability. Remember to allow for thick socks and trousers if you normally wear them inside your boots. If you normally take a half size, we recommend that you select a size above your usual size. For more generous fit, please select a size above your usual size, especially if you are going to wear them for prolonged use (e.g. a full day of hunting or working). The choice of a liner should have no impact on the fit and shape of your boot (as manufacturers allow for this), and so shouldn’t influence your choice of size. 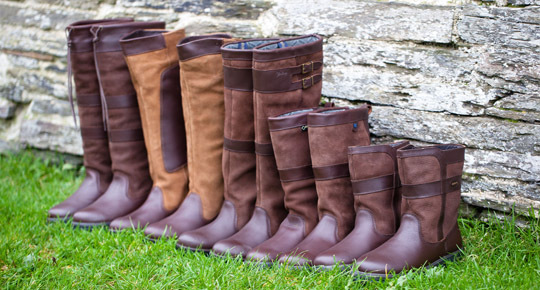 Barbour Boots, Dubarry boots, Footwear, hunter boots, Joules Boots, Le Chameau Boots, Wellies, wellington boots, Welly. Bookmark.